Spring Fling weekend at Penn was a two-day festival held in April in the Quad. 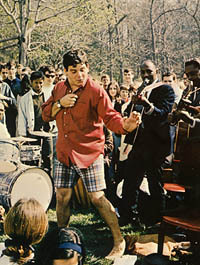 During the day there were food vendors, student performing arts groups and bands would sing or dance on a stage in the Lower Quad, and often there were games and other activities in the Upper Quad. At night there were concerts with popular bands or comedians performing in Irvine or Hill Field our senior year. We remember fondly the fun we had at Fling each year, even though it seemed like it was often cold and wet. 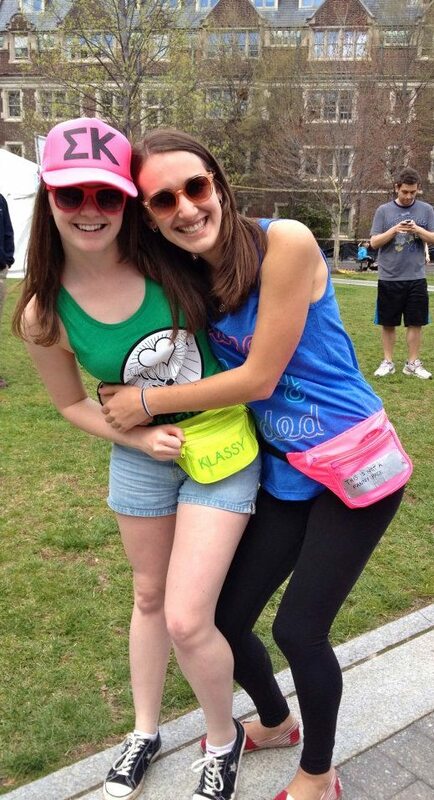 Amazingly, we have photos from Fling – and t-shirts – that our classmates shared with us. Take this trip down memory lane of Spring Fling 1990 – 1993. Photo courtesy of Derek Braslow. We think this is from a Fling – it looks like a Fling photo! This year, for the first time since it began in the 70’s, Penn’s Spring Fling was moved to Penn Park and was only on one day. We wonder how the students of today will remember Fling. 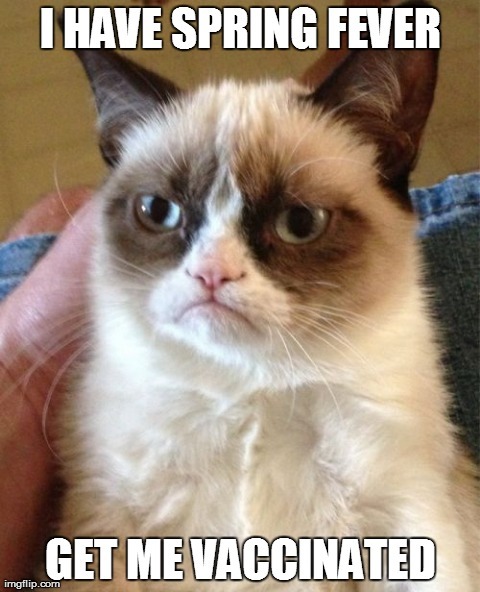 Do you remember Fling when you were a student? The weekend of April 13 – 14, marked 4 weeks until the 25th Reunion of the Penn Class of 1993 (May 11 – 14, 2018)! Meet us at the Button! Register NOW to attend our 25th Reunion! Follow us on Twitter, Tumblr, and Instagram. Classmates are invited to join our Facebook and LinkedIn groups. Donate to The Penn Fund in honor of our reunion! 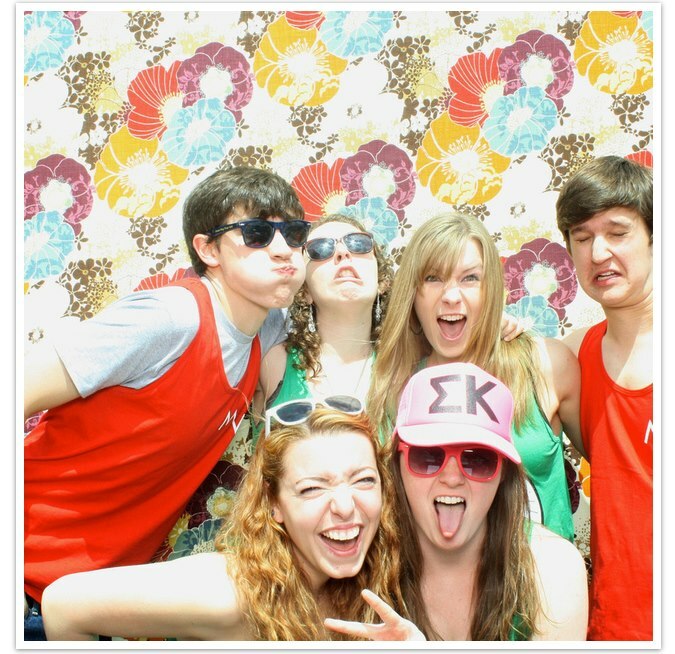 We want to break the 25th reunion participation giving record and every gift matters! Do you have old photos or mementos from our time at Penn? Photos of Spring Fling? Football at Franklin Field? Classes at DRL? We are taking a trip down memory lane and would love for you to share your memories with our class in a future post. Please email us upenn1993@gmail.com! Book your hotel room or AirBnB now! See our class website for details. As we continue counting down the 93 weeks to our 25th reunion next May, I asked fellow classmates to dig through their boxes, sort through their photos, and rack their brains for mementos, photos and memories to share of our time at Penn. Here are more found items from our classmates, this time from Steve Jung, C’93. Steve shared Penn basketball programs and tickets with us in our 66 week post and Performing Arts programs in our 68 week post. Here, Steve shares some of the tickets he saved, and it is a pretty diverse selection. Steve’s ticket collection includes: multiple tickets to the Class of ’23 Ice Rink, Spring Fling concert from 1991 featuring the Indigo Girls, Penn vs. Cornell Football at Franklin Field in November, 1993, ticket to see Lady Margaret Thatcher, and a ticket to see, “Ferris Bueller’s Day Off” as one of our Feb Club events. Wow! What types of events did you attend while at Penn? Did you save any of your tickets? The weekend of April 28-29, 2017, marked 54 weeks until the 25th Reunion of the Penn Class of 1993 (May 11 – 13, 2018)! The band performing here is Chaos Theory, which I am pretty sure was a band of Penn students. As you can tell from the photos, I apparently was a bit obsessed with the lead singer. Anyone else want to admit that too? Chaos Theory performs in the Lower Quad. Note all the students watching from the dorm rooms. It wasn’t all about Chaos Theory. I did find this other photo of another student band. Judging by the lack of a crowd, my guess is that they performed early in the day, while most people were still sleeping. Do you have memories of Spring Fling? We are looking for more classmates to share their favorite memories from our time at Penn. Let us know what you remember from Fling in the comments below. March 24-25, 2017, marked 59 weeks until the 25th Reunion of the Penn Class of 1993 (May 11 – 13, 2018)! It’s Spring Fling this weekend at Penn, which is interesting as it’s the weekend before the final weeks of classes (and thus also the weekend before Hey Day). Were our Flings so close to the end of the semester? I honestly don’t remember. I remember having fun at Spring Fling, but I don’t remember the concerts much. I managed to save a ticket for the Air Band concert from 1990’s Fling, but I’m not even sure what that was! Do you remember any Fling concerts? Here’s the schedule for Fling in the Quad this year. I hope all the students have fun! March 17-18, 2017, marked 60 weeks until the 25th Reunion of the Penn Class of 1993 (May 11 – 13, 2018)! Spring has finally sprung on campus, dear Quakers, and just in time for Penn’s greatest weekend ever: it’s time for FLIIIIING! 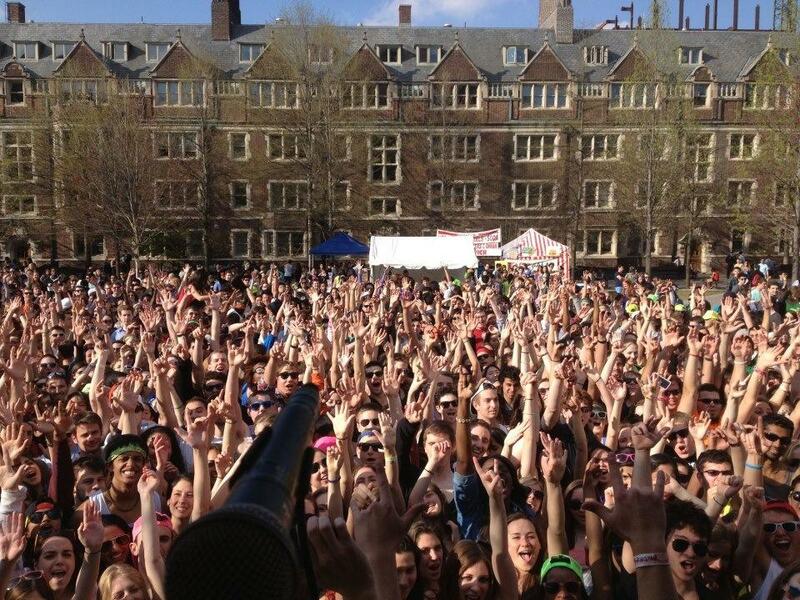 In case you’ve been living under a rock, or you just happen to be reading this blog post and you don’t go to Penn, Spring Fling is the biggest (and best!) college festival on the East Cost, in existence for now over 40 years. The festival actually has a pretty rich history and is certainly one of Penn’s biggest traditions. Without a doubt, it’s the favorite tradition among students! The theme for this year’s Fling is the oh-so groovy ❀☮ PEACE LOVE AND FLING ❀☮ I’d be lying if I said I wasn’t super excited. SPEC has a great line-up for the big concert on Friday: Magic Man, Ra Ra Riot, and headliner David Guetta! I wasn’t familiar with the first two artists when SPEC first announced them, but after to listening to them on Spotify I am so stoked to see them perform live. Here are a couple favorites of mine from Magic Man and Ra Ra Riot, both of which I hope are played at the concert! Lilly and I before CP takes the stage! The final performance, however, is going to bring the walls of the Quad down. Some lovely ladies of Counterparts (Sam, Swaroop, Lilly) and I will each be singing with the Mask and Wig band! Their performance is the final one of the entire Fling weekend, and it always draws a huge crowd. I can’t wait to be up on stage with them, mostly because my performance is going to be something I’ve never done before. I’ll be singing the song Timber by Ke$ha and Pitbull. Well, actually, I’ll be rapping it. Yes, you read that correctly. I’m going to be rapping Pitbull’s part of Timber. And I literally cannot wait. A crowd shot from the Mask and Wig stage. I’ll be up there in almost a week! So grab your fanny packs, don your neon tanks, and make room for the fried oreoes, dear Quakers. The countdown to Spring Fling begins NOW! 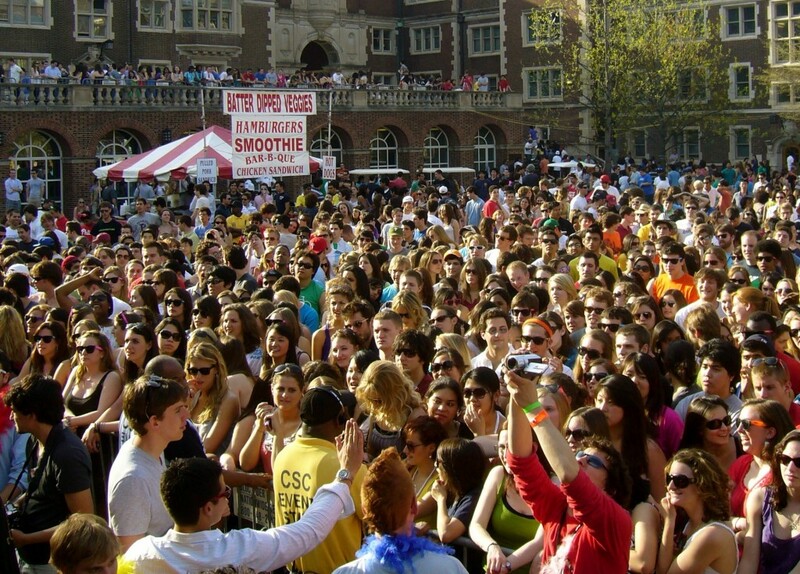 That’s right, this past weekend was Penn’s most famous celebration—Spring Fling. The entire student body crowded the quad for fried Oreos and student performances. We flocked to Franklin Field to party with Fiasco and Flo Rida and on Sunday morning shared in the mournful act of putting our neon back in the closet. As a freshman, my first fling was certainly memorable. I got to wear my neon purple leggings without judgment for the first time. I took the weekend off from homework. 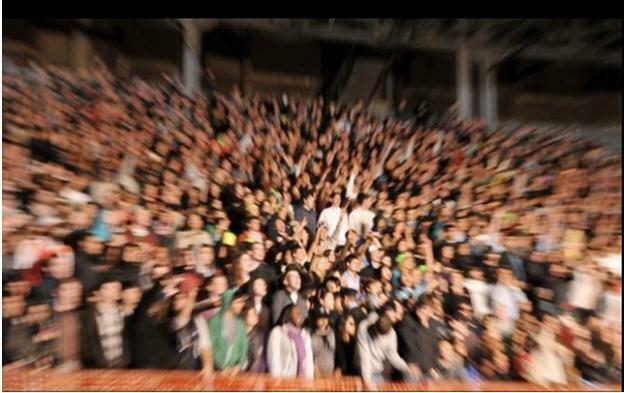 But the most important thing about fling was that I was doing it with 10,000 other undergrads. This was the first time I’d seen Penn’s student body come together as a whole. The energy was inescapable. There was a moment at the concert when I had to take my eyes off of Lupe Fiasco, and turn around. I looked behind me and saw 3 sections full of students, screaming an a capella version of “Superstar,” all waving their arms at the same time. All of us. Together. Of all the things we could be doing together, jammin’ to lupe fiasco isn’t the most impressive. But at that moment, I didn’t feel like a freshman, or an Urban Studies major, or a student in the College. I was just a Penn student, on equal ground with everyone else, partaking in possibly the most quintessential Quaker experience ever. And it felt fling-tastic. Check out the fling-stivities video and slideshow to see for yourself! With Penn’s annual Spring Fling weekend just days away, I find myself thinking about the origin of this famous (some might say infamous) Penn tradition. According to University Archives, Spring Fling actually grew out of an earlier Penn tradition known as Skimmer. 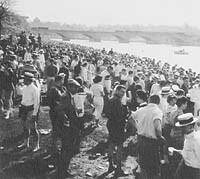 Beginning in 1949, Penn students would gather on a Saturday each spring on the banks of the Schuylkill River to encourage the Penn crew team. This tradition soon expanded to become a weekend of social, musical, and athletic events both along the river and on-campus. Soon thousands of students from up and down the East Coast flocked to Skimmer, enjoying not just the races, but also the jazz bands, the motorcades, the “co-ed” poster contest, the concerts, the dances, the fraternity parties, and the beer. Unfortunately, the event turned out to be too popular for its own good. Large crowds, combined with youthful high spirits (and alcohol), eventually led to injuries, property damage, and arrests. Over time, the focus of Skimmer Day/Spring Weekend shifted more and more away from off-campus activities along the Schuylkill River to organized events on-campus. This year, Spring Fling activities will take place across campus – from the headliner concert at Franklin Field to the carnival in the Quad and everywhere in between – and will attract nearly ten thousand revelers. The headline concert in Franklin Field – featuring Lupe Fiasco, Ratatat and Flo Rida – has already sold out at over 8,000 seats. The campus may have changed over the years, but the spirit of celebration at the start of this new season has not waned. In fact, it grows stronger each year.